HTC Vive Wireless Adapter review: Wireless VR dream or overpriced nightmare? There's no denying the HTC Vive wireless adapter is a joy to use. It's fully capable of delivering an accurate VR experience without wires and makes a big difference to immersion. That said, the cost and technical knowledge required may put many off. For a long while, cables have been a necessary evil of virtual reality gaming. Because of the processing power required to run these high-end devices they need to be tethered to a powerful gaming PC to run smoothly and provide the best experience. But playing is no fun if you're constantly finding yourself knotted up in cables or having your movement restricted. The HTC Vive wireless adapter cuts the cord. It uses a new technology built on the foundations of Intel's WiGig tech, designed to improve your experience by ditching the cable and allowing more freedom. We tested it at Gamescom 2018 in Germany and loved it. Now we've had our hands on this adapter for two weeks to see how it handles in the home - and whether it's worth its £300 asking price. The first bit of good news is the adapter works with both the HTC Vive and Vive Pro, so you're good whichever device you have. Though there is an extra cost associated with the Vive Pro as you need a few extra adapters to make it work - pushing the price up to $360/£365. The second bit of good news is that this wireless adapter is backed by Intel's WiGig technology, meaning the tracking is accurate and powerful. Indeed, HTC claims this system allows near-zero latency VR gaming experiences, despite being wire-free. During our testing, tracking quality seemed impressive and accurate. Even in a game that's fast and frantic, the headset manages to keep up - and we've not noticed any lag. We did notice some occasional blockiness - presumably due to interference or latency, but these issues are few and far between. 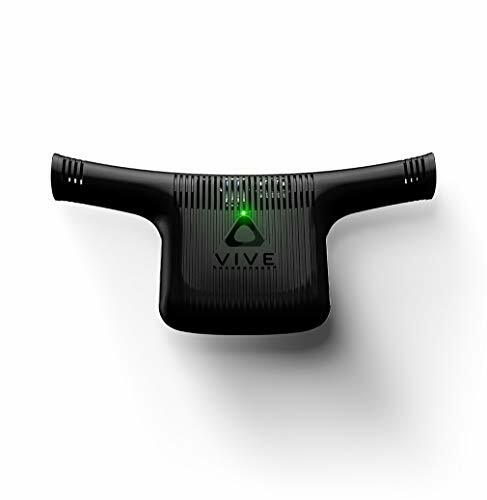 It's not the first wireless adapter we've seen working with the Vive - we tested the TPCast system ourselves and that's a fairly capable system - but this is the official Vive accessory, with all the reassurance that comes with that. The Vive Wireless Adapter kit comprises several elements: a PCIe card for your PC, a transmitter/receiver, battery pack, and the T-shaped adapter which sits on the top band of your HTC Vive or Vive Pro. The adapter itself is large and looks cumbersome - but is far from it when worn. Indeed, it is light and you do not notice it sitting on top of the headset. And no matter how unusual it looks externally, it has seemingly no effect on your enjoyment when immersed in a VR experience. You aren't completely wireless though, as the battery pack for the headset is wired to the main device. You wear it on your belt, like a wireless microphone pack or the like. Again though, that really doesn't get in the way and is a great improvement on the traditional cables. This does highlight one downside to wireless VR gaming though: not being able to play in your underpants. When playing vigorous games like Knockout League, getting sweaty is a common problem. HTC claims you can get around two-and-a-half hours gaming from a single charge of the battery pack. We found it was more realistically two hours, at which point the whole thing just turns off without any warning. Dang. The battery pack does come with USB-C fast charging, but still takes a good few hours to fully charge for another session. It's essential to charge between sessions or end up sorely disappointed in the middle of a game. For the moment, the HTC Vive wireless setup is a do-it-yourself affair. We've talked through the process before, but it essentially requires users to be fairly tech savvy. You need to be able to install a PCIe card in your gaming machine. If you're not sure what that means, then this might not be the upgrade for you and you might like to consider TPCAST instead. This installation process also makes the HTC Vive Wireless Adapter incompatible with any gaming laptop - as you can't generally make such upgrades to those machines. Another problem if you're relying on a powerful laptop for your VR gaming pleasures. Intel's WiGig card also needs installing in a PCIeX1 slot according to the setup instructions. However, we found that it wouldn't fit in ours due to the size of the screws on top (scraping against the heat shield on the I/O panel at the back of the motherboard), so we had to use a PCIeX4 slot instead. The instructions say this is a valid option and we can confirm it works, but it's a niggle nonetheless. That part of the setup is as bad as it gets though. The rest is mostly straightforward - unplug some cables, plug in some new cables, download some software, plug it all in and pair. Then some sort of black magic occurs with the transmission of data. All the action happens via the WiGig card. The linkbox from the Vive is no longer used and nothing needs to be plugged into your graphics card, which is impressive in itself. Yet somehow graphics and audio are capably beamed across the room. This setup is certainly more streamlined than the TPCAST option - which still requires the original linkbox and a Wi-Fi router. But the official approach is far from user-friendly if you're not confident in opening up your machine and installing upgrades. We've mentioned that the wireless linkbox itself doesn't necessarily interfere with play in terms of comfort. Its weight is not particularly noticeable and the trade-off with losing those nagging wires constantly tugging at your head is worthwhile anyway. What might be a problem in terms of comfort is the audio. This will depend on your setup. If you have a Vive Pro or Deluxe Audio Headstrap where the audio is built into the straps then there's no issue. But if you're using the original Vive with velcro straps and your own headphones or gaming headset then you might struggle. We were using Bose QuietComfort over-ear headphones and struggled to find a comfortable location for the headband. You can't put it over the top of the linkbox, so have to either put it behind or in front of it. This means the headphones either sit awkwardly or are constantly falling off. Not an ideal solution. Speakers on your PC or in-ear headphones might be a solution to this issue. We also noticed that the wireless link box does get fairly hot during use. Not ideal when you've already got a warm VR headset strapped to your face or are in the middle of a sweaty gaming session. We already have the TPCast wireless adapter, so would we swap that the official adapter? Yes. The official Vive solution is slightly more accurate and requires less gizmos to setup and work. That said, the TPCast option is more accessible to the layman who isn't confident installing the Wigig adapter and it has a better battery life thanks to the massive Ankerpower bank. All-in-all, the HTC Vive Wireless Adapter is an impressive bit of kit. It provides a superb experience - we saw very little lag or related issues that might have interfered with our experience - although it's a little limited by the small battery capacity. The biggest problems are going to be cost and technical expertise required to set it up in the first place. But that's a small price to pay for wire-free VR, which is otherwise an utter joy. The TPCAST wireless adapter has been around for a while. It, unfortunately, doesn't support the Vive Pro but it does come with a large 20,100mAh battery pack and so lasts and lasts during play sessions. It's also easier to install as there's no need to put anything inside your machine - meaning it's also compatible with gaming laptops. Tracking is comparable as is the price, so it's a valid alternative to consider.